89% of the Turkmen of Turkmenistan are affiliated with Islam and acknowledge Islam as an integral part of their culture. Ertugrul Gazi Mosque in Ashgabat, Turkmenistan. 89% of the Turkmen of Turkmenistan are affiliated to Islam and acknowledge Islam as an integral part of their culture. The central Asian country of Turkmenistan has no official religion, and there is provision for freedom of religion in the country’s constitution. Although most of Turkmenistan’s population is Muslim, there is a general low adherence to the religion in the country. Muslims in Turkmenistan do not strictly attend religious services but acknowledge the revival of the language’s importance to be a critical element of the country’s revival. Islam boasts the widest share of the country’s population, at 89% Islam is undoubtedly the most widespread of all the religions in the country. Sunni Islam is the most practiced branch of Islam among Muslims in the nation. The minority religion in Turkmenistan is Christianity with a 10% share of the country’s population. Other religions in the country make up a mere 1% of the country’s population including Jews. Before the advent of Islam in the country, Turkmenistan, like many of its Central Asia neighbors had Buddhism, Zoroastrism, and Christianity as the dominant religions. Sufi Shaykhs, mandated with spreading Islam, are credited with the introduction of Islam to the country. The Sufi Shaykhs were mostly adopted as ‘founders’ of particular ethnic groups or clans, and subsequently laid the foundation of extremely localized developments of the religion in Turkmenistan. Part of the Turkmen tribal structure is the holy tribe referred to as the ‘övlat.' Six of the holy tribes are active, and every tribe is believed to trace their ancestry to Prophet Muhammad through one of the Caliphs. Members of the övlat retain some level of spiritual authority to date. Islam in Turkmenistan was heavily suppressed in the Soviet era in place of Atheist doctrines. 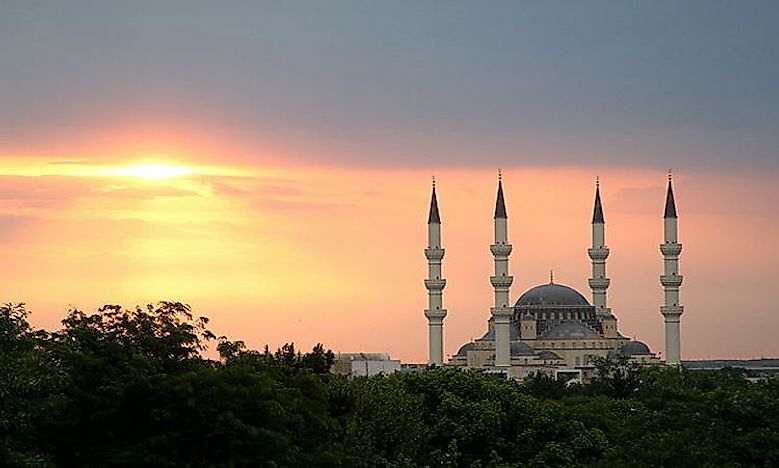 Mosques across the country were closed, and various Islamic practices were banned in the country. It was not until 1990 when efforts to revive the religion were instituted in an independent Turkmenistan. Islam was taught in schools, and there was a proliferation of mosques and religious schools in the country. Islam in Turkmenistan has evolved over time to become a mixture of Sunni Islam, Sufi mysticism and Zoroastrian, and shamanistic customs. Such Shamanistic customs includes the widespread beliefs in charms, evil eye, and amulets. Shia Muslim in Turkmenistan is mostly practiced by immigrants such as Iranians and Kurds. Christianity is the largest minority religion in the country. The advent of the religions can be traced to the 20th-century European immigration to Turkmenistan. The significant population of these immigrants is Russians, Armenians, Poles, and Germans. Most of these immigrants identify with Orthodox Christians, Roman Catholics or Lutherans. Smaller Christian communities are Jehovah’s Witnesses, Baptists, and Pentecostals. A small population in Turkmenistan identify as Jews while other identify with Hare Krishna and Bahá’í faith. Turkmenistan is a secular state and provides for freedom of religion for its citizens. Unregistered religious activity is, however, illegal in the country, including establishing worship spaces and holding religious services. Religious activities in the country are monitored and controlled by the Council on Religious Affairs (CRA). Minority religious groups have no representation in the Council, a situation which impedes on their religious capabilities. Minority religious groups have recently reported encountering difficulties while attempting to obtain permission to carry out religious activities. Unregistered religious groups have reportedly faced harassment, fines, imprisonment, and deportation. Ethnic Turkmen who convert to other religions face the highest level of societal harassment. The religious landscape of Turkmenistan is relatively unfavorable to minority religious groups.